The Ellen M. Leach Memorial Home was founded in 1996 as a result of a trust created in 1926 and the determination of the Taylor family. In 1926, Mabel W. Tyrrell, a widow with no children and daughter of Ellen M. Leach, composed a will which among other things established a trust for the lifetime benefit of various nieces and nephews. The named executor and trustee was Amos L. Taylor and the trust was initially funded with approximately $50,000. The trustees were directed to found and maintain a home for the aged and infirm in Brewer, Maine; name the home the Ellen M. Leach Memorial Home; and develop the home within 25 years of the last surviving niece or nephew. In 1989, John and David Taylor became the new trustees as well as the last surviving kin passed. John and David Taylor reformed the provisions of the trust to a tax-exempt charitable trust. After several trips to Brewer, Maine, a successful joint venture between the Taylors and Brewer Housing Authority officials resulted in the extraordinary Ellen M. Leach Memorial Home. Ellen M. Leach resided for several years in Brewer, Maine. Ellen M. Leach and Mabel W. Tyrrell are buried in the family plot at the Oak Hill Cemetery on South Main Street in Brewer, Maine. 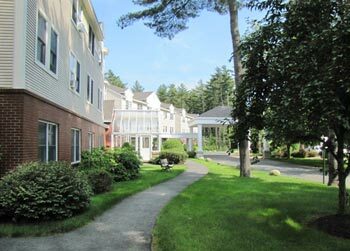 Having lived in other retirement homes in the area, I can honestly say the Ellen Leach Home surpasses them all in price, food, resident camaraderie, medical transportation and above all peaceful, quiet surroundings." ~ Howard F.
Moving here was the best possible decision we could have made at this stage in our lives. The entire staff is very kind and caring to everyone. We know it gives our family members peace of mind knowing they don't have to worry about us." ~ Gloria & Jerry R.
I moved in last July and it was the happiest move I could make. It is just like home! I found many old friends and made new ones. The food and service are excellent and I would recommend it to anyone." ~ Phil P.
Four years ago I was living alone. I lost most of my eyesight in one eye. At that time, I was 91 years old. This gave me a wake-up call. It was time to be around other people. Checking out the independent living homes in the area, the Ellen Leach Memorial Home was the most appealing to me. The people here are friendly. The wait, cook and cleaning staff are proficient, helpful and very caring. I am now 95 years old, and I know I made the correct decision." ~ Ed H.
I feel very fortunate to call the Ellen Leach Memorial Home my home. The facility is safe, comfortable and very well maintained. The atmosphere is friendly and home-like, and the staff is outstanding. The meals are varied and excellent. Events are provided to inform and entertain. It is a wonderful place to live, and I am so happy to have made that choice." ~ Barbara H.
My mother spent two very happy years at the Ellen Leach Memorial Home. The facility is extremely clean and comfortable. Mom enjoyed the available activities and especially liked sharing the meal at noon with others. The entire staff, from the cleaning crew up through administrators, were very caring, kind and positive. I am grateful that she was able to be in such a loving community." ~ Nancy M.
Copyright © 2001-2019 Ellen M. Leach Memorial Home. All rights reserved. Website by Barnstormer Design Group.